What is the real issue with focus at the Vodafone Warriors? After a horrendous week for the Vodafone Warriors, Radio Sport has been running hot with a huge number of people giving their view on what is wrong with the team leading to such inconsistent results! I have not heard anybody actually talk of the real issue which I suspect is at the top of the organisation. Before getting to the source of the poor focus at the Vodafone Warriors, lets look at some observations creating my view! The one constant in the last 4 plus seasons has been an inconsistent Warriors team. This has been shown as great variation in the way they play, they seem to lack spine with inconsistent effort under the most recent 3 coaches. Before the current Warriors coach Andrew McFadden, this inconsistency in effort and results also occurred under Matthew Elliot and Brian McLennan. Before that the more consistent Ivan Cleary coached team showed some better results with almost a 50% win ratio. 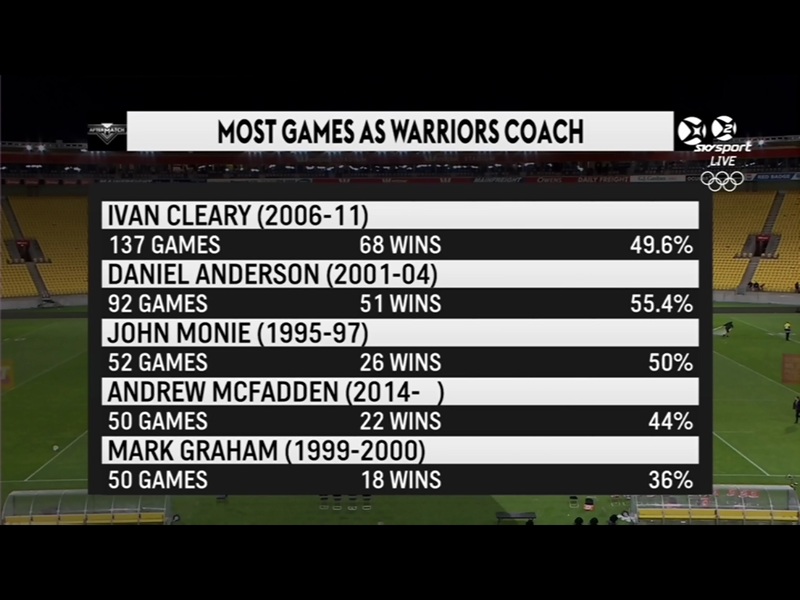 This above graphic from Sky Sport shows the win percentages of the longer serving coaches. So if 3 coaches since the more consistent Ivan Cleary has not changed the results, what else could be causing the situation. Will changing the players fix the inconsistency? Difficult question as the Vodafone Warriors have now started their 5th seasons of inconsistent results under the 3 coaches and many of the players have changed, yet we still have this culture of inconsistency. So what else can be changed as we seek to find the key to gaining the right culture and focus creating a champion team. Based on a 2016 Radio Sport interview of former Warriors coach Matthew Elliott, I suspect the focus is wrong at the top. He explained that when he was Vodafone Warriors coach, a very successful business man was too influential and that person should stick to business, rather than getting so involved in the coaching. He seemed to be suggesting that the coach needed to take full responsibility for coaching the team without external influence. He did not use a name in that interview but it was obvious that he was talking about owner and chairman Eric Watson. I suspect, well this is my gut feel or perhaps guess is more accurate, that Eric Watson could be the influence of the wrong focus and culture creating their inconsistency. I believe the team may be getting mixed messages and is too focused on the win outcomes that Eric Watson desires, not the process and behaviours that create this outcome. He has been the consistent ownership element of the Vodafone Warriors since the end of the 2000 season. Lets assume that Eric Watson this season was really focused and always talking about his objective to win a NRL title after spending big on top new recruits this season. So he could be telling everybody internally this is his vision. He is a very successful business owner and founder of Cullen Investments, having build a large business empire, he knows in business how the leader can create the focus and culture, driving people towards his goals, and heads will roll if he does not get his objectives. So perhaps his pushing over the last 4 to 5 seasons is the external pressure creating the culture which has this year been shown as player frustration and disjointed results. Eric Watson’s success in business is undoubted, yet for a sports team, winning is the outcome of doing a set of behaviours better than the opposition. An old cliche is we cannot always control the result, just the way we play. Hence the key point could be that they are over attached to an outcome which puts external pressure on the wrong elements which provides a team culture that is destined to implode, to fail. If they were to focus on building the right behaviours or elements that lead to that outcome, then a culture can be created to include enjoying their sport. Nobody in sport talks about this more than our very own world number 1 kiwi golfer, Lydia Ko, she often talks about going out to enjoy her golf. An element which helps her relax and create the correct mindset for peak performance, and create outstanding consistent world beating results. As a long time follower of the Vodafone Warriors, this season I have noticed more visible frustration and outward anger during matches from the players, suggesting that enjoying their sport is something a very long way from focus. Another interesting indicator of lacking heart when putting in effort, could be taken from a post match interview from a Vodafone Warriors player Tuimoala Lollhea. This was after the impressive win a week ago against Canterbury bulldogs, when Tuimoala Lollhea said that the “Theme for the past week was desperation.” While this focus certainly worked that week for the team, it suggests the players lack the intrinsic player motivation to do it themselves. Some studies have demonstrated that offering excessive external pressure can lead to a reduction in intrinsic motivation, in psychology this is known as the over justification effect and can have a serious impact on your motivations and behaviours. Essentially a very successful team culture is driven from within by players going out to play the sport they love which in some professional teams this focus seems to be lost. Hence why it appears the Vodafone Warriors are needing extra external pressure to get them up for the match on the day. Lets create an example of a different focus with the outcome we wish being to win, yet the purpose is to build a fun, passionate group of people who love being together as a team giving 100% wishing to enjoy playing league. If that was the focus rather then the assumed business drive just on results, how different could the team focus be! We then can measure the effort and desire every week as the core indicators creating the right execution and drive to win creating the end result. The key I believe is to create an environment so that professional sport feels like “play” rather than like “work” which appears to be how the Vodafone Warriors view it now.